Midway's brilliantly re-imagined version of their classic arcade title Spy Hunter was one of last year's surprise hits and thus, it's not surprising that a sequel is on the way. Spy Hunter 2 takes most of what made the original game so much fun and adds many new features including a completely redesigned Interceptor vehicle, a deeper weapon system, improved enemy AI, and an intriguing new female agent. These significant changes should keep the gameplay fresh while not alienating fans of the original. Join us as we examine what should make Spy Hunter 2 one of the fall's most exciting releases for action fans. Spy Hunter 2 builds on the successful sequel last year, which was itself based on a classic early 80's classic arcade video game. 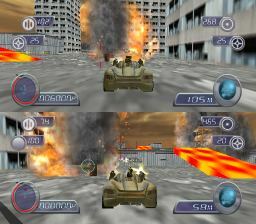 Fans of the classic games were thrilled to see the series transformed into full 3D with fast speed and intensity that made for a thrilling ride. 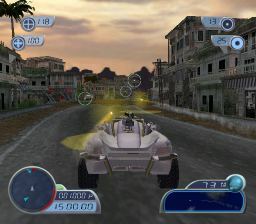 The modern Spy Hunter's graphics and weapons were updated and the franchise was revitalized with new mission based gameplay and cool new modes. With all the changes, the feel of the original title was quite evident throughout and made the remake appeal to both older gamers and newcomers. Set for release this November on Gamecube, Xbox and, PS2, this much anticipated follow-up should deliver thrills for fans of the series. Spy Hunter 2's espionage-laden plot takes up where the first game left off and players will once again take the role of secret agent Alec Sects and will find out more about his background and who he really is. SH2 also introduces a mysterious new female agent who's past is somehow connected to Sects', which should make for a deeper and more intriguing story than the first game. Players will once again battle the evil NOSTRA terrorist organization throughout the game, though this time, the NOSTRA forces look to be smarter and deadlier than before with increased sophistication. This means that they'll be harder to take out while they try and stop Sects from saving the world once again. 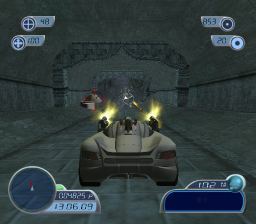 Once they get through each mission's main part, they'll encounter end-of-mission bosses. The game will include 8 NOSTRA enemies that will take brains and brawn to defeat. Spy Hunter 2's enemies won't be as dumb as they were in the original game, and will feature an intelligent AI system that will allow these foes to react to the player's movements and tactics. Spy Hunter 2 retains the mission-based structure of the original title but adds more branching that will allow players a lot more freedom than the first Spy Hunter. SH2 will feature 16 levels in four massive regions with all-new bosses awaiting them at the end of each course. The levels themselves are going to be much more interactive and dynamic, allowing players to choose their own paths through each level. This should increase the game's replay value exponentially and give it plenty of longevity. Like the first game, players should also expect loads of unlockables including extra levels, weapons and DVD content such as movies and behind the scenes features. Players will immediately notice that there's a completely redesigned, sleeker look for the famous G-8155 Interceptor. While it keeps some of the original Interceptor's feel, the upgraded car has a sleek new body design. The Interceptor's changes are more than skin deep and the vehicle now sports an array of deadly new weapons under the hood. Players will also be able to play with more style thanks to SH2's new advanced weapon and equipment system. This will let you customize the vehicle with your own weaponry which will allow for a more customized, personal style of play. Additional customization will come with the weapons, which are now fully upgradeable as you progress through the game. This should improve the game's replay value dramatically, with many more options, allowing you to test different weapons systems and find out which ones are the most effective. The Interceptor's coolest feature is that it can transform or morph from its standard mode into entirely new forms of transport. These are accompanied by a cool animation that makes the car the real star of the game. 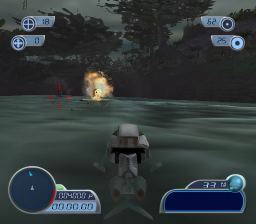 Many of the transformations are carried over from the first remake, such as the water-based boat, but there is a new snowmobile mode that allows the Interceptor to glide over snowbanks, plus a new four-wheel drive mode for off-road driving. These definitely sound cool and will give SH2 more variety and surprise than the original game. In addition to the morphing vehicle, your interceptor is well stocked for high-octane combat. It will have a decent arsenal of basic defensive weapons such as the oil-slick and rear fog have been enhanced and now include mines and radar-jamming codes. Players will also have new offensive weapons such as an Auto-tracking turret, flamethrower, and an indestructible armored shield. These should add a lot of depth to the gameplay and will give players more options, allowing them to play Spy Hunter 2 more strategically. In addition to your weapons cache, you'll also have a secret weapon: Leonie 2.0. This is the latest version of the Interceptor's online computer who will help you along the way. Leonie 2.0 will give the players information and tactical advice during missions. Using the computer effectively can give you an advantage and allow you to anticipate Nostra's actions and movements ahead of time, and warning you of potential dangers lurking on each level. While the main thrust of Spy Hunter 2 is the single player game, there will also be several other modes of play. These will include a split screen mode that allows you and a friend can battle it out against each other. While it may seem like more of the same on the surface, the new weapons systems, branching levels, and intense action should definitely make this sequel worthwhile. Overall, Midway looks to have another winner on its hands. Spy Hunter 2 looks to be an exceptional follow-up that should please fans of the first Spy Hunter title, with an outstanding mix of high-speed racing action, deep mission based play and a compelling storyline. The original title was an excellent update, and this looks to be another solid installment for the franchise and definitely one of this fall's most compelling action releases.